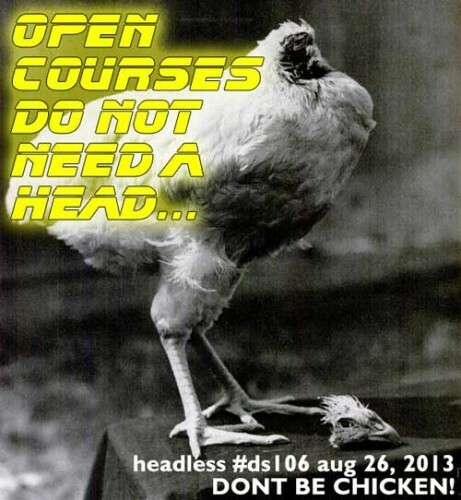 In about 10 hours the first week of Headless ds106 launches– the first week’s assignment will be published at one minute past midnight (PST) and will appear at http://ds106.us/category/the-site/fall-2013-headless/. If you have been around the ds106 bend before, what you can do to help is welcome people, offer advice, and model good ds106 blog writing behavior. Or document your creative process. Or share your favorite work from the past. Or do Cat Breading. Whatever. Of course, as an open course, everything on the week’s list is optional. No grades, no lecture videos, no apologies. And for those who are new to ds106, it is going to look chaotic at first. And later. This is not a course of rigid syllabi details, we are not going to offer explicit instructions on how to do your creative work. The idea is not to learn directly from an instructor, but to learn alongside others figuring it out as well. So you know what is coming (you can get a general idea from the syllabus, yes there is one of those), this week and next are for having people get their blogs un shape, explore how to customize them, do a bit of small media creations, explore the ideas of personal digital space. IN week three, we move into an introduction to digital storytelling, and in week 4 we enter the creative long stretch of the course, starting with appreciating (by listening) to audio storytelling. Although we call it “bootcamp” the first two weeks are pretty light- this gives everyone a chance to learn their way around, to get in the social media mix, and providing some flexibility for those who jump in during this stretch. As far as the chicken? Do you know the story of Mike? “Miracle” Mike the Headless Chicken (April 1945 ““ March 1947) was owned by farmer Lloyd Olsen of Fruita, Colorado. On September 10, 1945 Lloyd was sent out to the yard by his wife to get dinner. If THAT is not a metaphor for open learning, for dealing with your hand, for going against the grain. I don’t know what is.